Get Vendio Gallery - Now FREE! 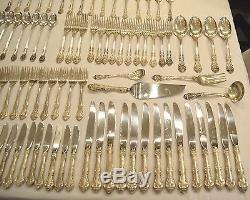 Gorham Sterling Silver King Edward Flatware Service 84 Pieces. 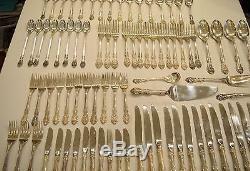 The flatware service includes 3 place forks 7-1/2 inches. 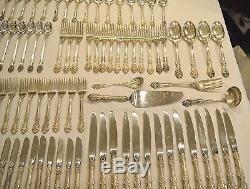 (3) place size salad forks 6-3/4 inches. 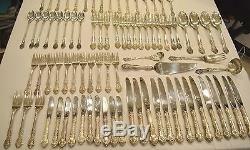 (11) salad forks -6-1/4 inches. (16) tea spons 6 inches. (8) ice tea spoons 7-1/2 inches. (10) hollow handled stainless steel blade butter spreaders 6-1/4 inches. (3) place size modern hollow handled stainless steel bladed knives 9-1/8 inches. (11) modern hollow handled stainless bladed knives 8.75 inches. (1) hollow handled stainless bladed steel pie server 10-3/8 inches. 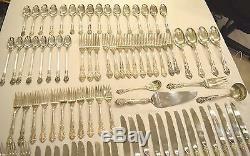 (4) large table/serving spoons 8 3/8 inches. (1) serving fork 8 inches. (1) sugar spoon 5-3/4 inches. (1) gravy ladle 6-3/8 inches. They are all in excellent pre-owned condition, commensurate with age and use. Counting the hollow handled items at 1/2 ounce each and weighing all the sterling silver pieces there is a guaranteed 92.73 troy ounces in this set. 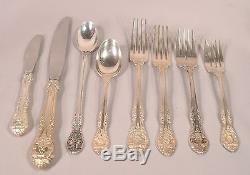 This is a great vintage collection of Gorham King Edward Sterling Silver designed in 1936 by J. We are happy to assist you. All items offered are guaranteed genuine and accurately described. We do not mark merchandise values below value or mark items as "gifts" - US and International government regulations prohibit such behavior. 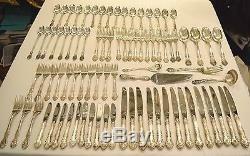 The item "Gorham Sterling Silver King Edward Flatware Service 84 Pieces" is in sale since Friday, November 17, 2017. This item is in the category "Antiques\Silver\Sterling Silver (.